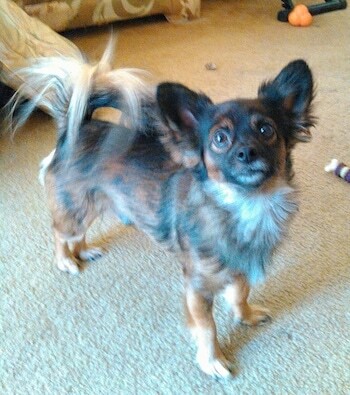 Peanut the Pomchi at 2 years old-"Peanut is a very well maintained black and tan Pomeranian / Chihuahua mix. He has a very very great temperament. He was rescued by myself from an owner who neglected him. He was beaten by the kids. 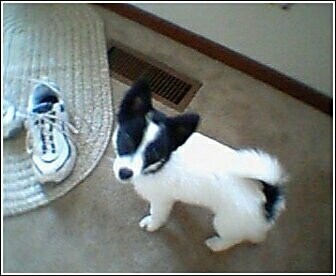 I went through everything I had to bathe him nermerous times until I got him to his handsome self. His whole new outlook is now a happy loving best friend. I could not have asked for a better pet and family member. I am disabled and Peanut saved my life as well." 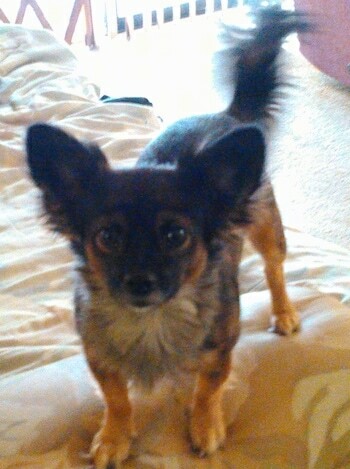 "This is my male F1 Pomchi puppy at 10 months old, Miko. He is incredibly energetic, refuses to be less than the center of attention & has nothing but love in his heart. He's excited about everyday he wakes up & is by my side for every step made. Miko is incredibly affectionate, waits patiently for my eyes to open everyday to snug right into my neck for affection and his morning belly rub. He lives everyday by never letting any moment go wasted And doesn't have a shred of anger or negativity in his 4 3/4 lbs body." 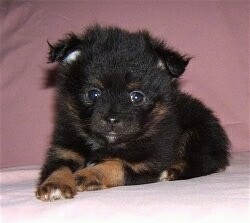 Bruce Wayne the Pomchi puppy at 4 months old, playing with his Halloween candy corn toy—"We call him Bruce. 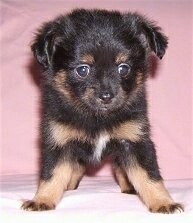 His mom was a Pomeranian and his dad was a longhair Chihuahua." 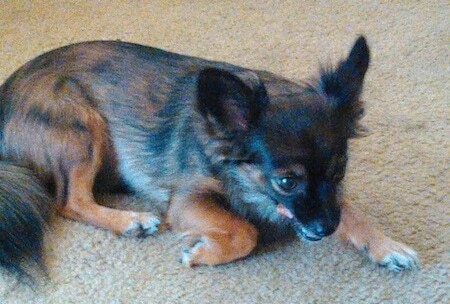 Bruce Wayne the Pomchi puppy at 4 months old, playing and checking out his first carved pumpkin. 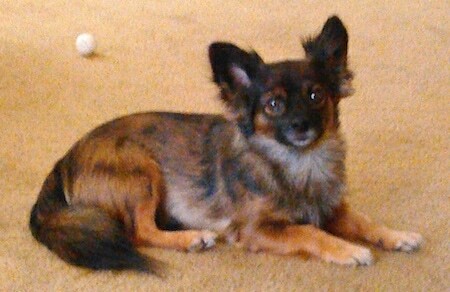 Bruce Wayne the Pomchi puppy at 6 months old—"You can see his fur has gotten much longer and fluffier. Also, the long fur that's grown in is black, so he is much darker than when he was younger. I took this picture during a blizzard. He loved the snow; he was running through huge drifts and trying to eat it all. I could barely get him to come back inside!" 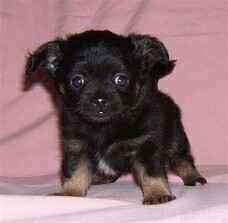 Pudgie the Pomchi all grown up! The proud parents of 4 babies! 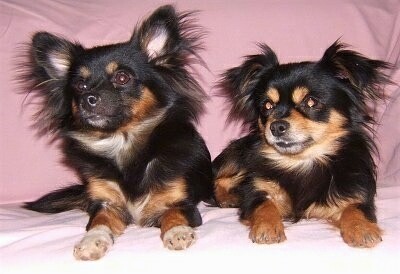 Parents of the pups below: (left) female, 8 pounds (right) male, 4½ pounds—both of these adult dogs had Pomeranian mothers and Chihuahua fathers, which make their puppies F2-generation puppies. 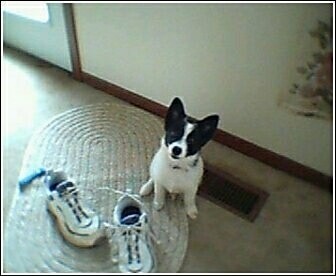 This can be shown as: (Parents) Purebred-A x Purebred-B = F1 Hybrid Dog... their pups are therefore F1 x F1 = F2 Hybrid Dogs. 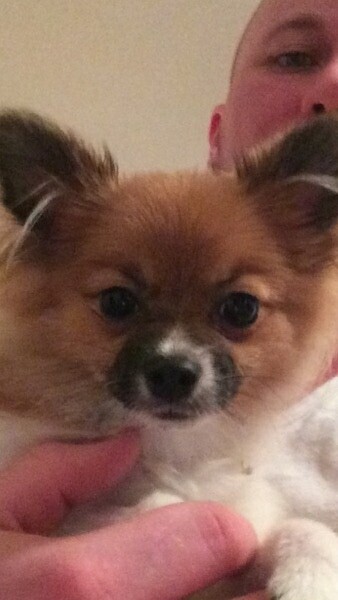 "Bruiser is a Pom-Chi. He is 6 years old (in this pic), or that is my vet’s guess. He was a rescued dog. I've had him for 3 years now. Sweetest dog I've ever seen." 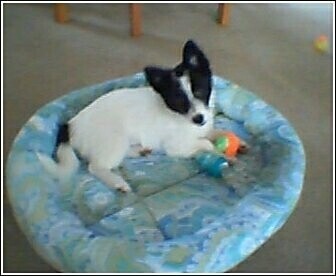 Snoopy is a Chihuahua / Pomeranian mix. 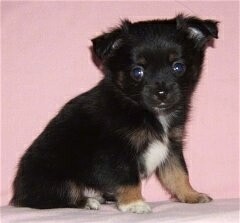 Susie is a Pomeranian / Chihuahua mix. Ziggy at around 2 months; his ears weren't standing up yet in this photo.